ATLANTA, GA, JULY 31, 2014 – Yesterday, Generation Orbit Launch Services, Inc. (GO) completed the initial captive carry flight of the Flight Experiment Testbed (GO-FET). Operating out of Cecil Spaceport in Jacksonville, FL, the three hour test flight served as an demonstration of air launch operations both on the ground and in flight. The flight configuration consisted of a Learjet 35 carrier aircraft with a standardized pod integrated to a wing hardpoint. The set of payloads carried within the pod were designed to gather environmental and dynamics data on propellant management, payload integration, and wireless communications. 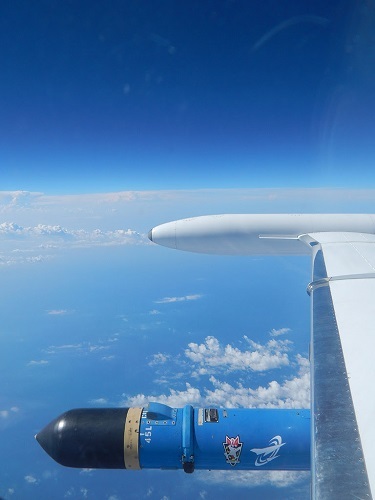 The flight also included a 1U CubeSat payload from BlueCube Aerospace, an educational outreach organization dedicated to bringing CubeSat development to middle school and high school classrooms. Data gathered by the custom-built data acquisition system during the flight will be utilized for launch environments characterization and model validation relevant to the development of the GOLauncher family of launch vehicles. All primary and secondary test objectives were met during the flight. The flight plan was devised to explore the handling qualities of the aircraft while conducting the high altitude, high flight path angle launch maneuver designed for GOLauncher 1 and GOLauncher 2. Results of the test demonstrated that this maneuver can be completed safely while meeting the requirements of the rocket vehicle release condition. In preparation for the flight, Cecil personnel conducted a dry-run of spaceport launch operations including coordination with local air traffic control, oxidizer loading, runway closures, and prohibited vehicle and personnel movement. Atlanta-based Generation Orbit Launch Services, Inc. (GO) focuses on providing fast, flexible, and dedicated space transportation services for small payloads. GOLauncher 2 supplies microsatellite, nanosatellite, and CubeSat customers with reliable and affordable access to space. The unique air launch approach developed by GO and its development partners offers flexible launch capabilities, poised to reduce fixed infrastructure needs, launch costs, and the time from contract signature to launch. Air launch system experience at GO dates back over 10 years, providing a distinct advantage throughout the design and analysis process. As a systems integrator, GO compiles multiple aspects of the launch architecture to provide a streamlined service to scientists, researchers, and industry customers alike. For more information, visit GO on the web at www.generationorbit.com and follow GO on Twitter @generationorbit.